How can we engage children in the education process? How can we get them excited about learning? What will make them look forward to going to school everyday? Gandhiji strongly advocated that the purpose of education is to prepare children for life through life and for that, teaching and learning needs to be connected to their life. Connecting teaching and learning to the local context of children provides the much needed relevance and meaning to the education process. It not only helps children in developing a better understanding of their environment but it also makes the learning process real and active for them. With better understanding of the local context, children find themselves better equipped to take responsibility for it and their action. Proactive citizenship is about actively engaging ourselves in the civic issues of our locality and taking responsibility for them. This is one of the important goals of education. For this, we need to prepare children from very early in their life. We need to take civic and other important issues from the community as a learning context/pedagogic medium and learn how to build systemic understanding of them, how to find leverage for change, how to act and make a difference. Children having gone through such learning experiences during school education are better prepared for life. They develop skills and process of understanding complex community challenges and how to act for change. Their action quotient is high. The ability to act depends on our ability to think and our ability to think depends on our ability to see. Therefore, what we see is important. Developing our ability to see things systemically empowers us to act effectively and responsibly. Systemic thinking is a discipline for seeing relationships between parts, for seeing patterns rather than static snapshots and events. It is about seeing how one's thinking affects the situation and the outcome. Actually, it is about seeing our own connections to what is happening in the real world and finding the leverage for change and growth. Service is about working for the highest good of all without attaching any personal desires to it. It is about demonstrating social and environmental responsibility as a community member. It not only helps us in understanding the community better but it also generates respect for the community's lifestyle, traditional wisdom and resilience. Experiences of service provide opportunities to learn how to contribute meaningfully towards the larger community causes and in the process children experience the joy of working selflessly. It is during service that the theory and principles learnt are tested on real grounds. Children get first hand experience to empathize and connect with issues of equality, justice and denial. It is during service that the dominant paradigm of competition, material success, scarcity mindset and monolithic standards of living gets challenged. Powerful experiences of service encourage learners to question their own self-centered life style. 6. EXPEDITIONS AS PEDAGOGY FOR LEARNING AND DEVELOPMENT. Expeditions comprise of engaging experiences that challenge the learner cognitively, physically and emotionally, leading to new awareness, sensitivity and understanding in learners. In an expedition, learners set out to explore the unknown as a crew and in the journey they rediscover and re-connect with the self and the world around. The important aspect of the expedition is that it has the element of curiosity and creative anxiety at every step. Therefore, it helps the learner experience and understand how he/she navigates the unknown challenge and develops his/her capacity further. How one navigates the unknown is one of the important life skills. Expeditions happen in crews. Working in crews help learners build mutual trust and respect, and this is then extended to the community as a whole. It is here that children sow the seeds of shared commitment and inculcate a sense of responsibility for self, others and the society at large. Working on real life problems in an expedition set the context for children to work in crews- as real life issues are complex and can't be solved alone. Working in crews during the school helps children understand the value of interdependence and respect, which prepare children for fair, just and equal society. It also lays the foundation for peace and tolerance in society at large. The purpose of education is not only to develop the required knowledge and skills in children but also to develop the fundamental capacity of learning how to learn and the mindset of creation and possibilities. We would like children to experience, understand and practice self-reliance and sustainable living i.e. living in harmony with nature, the inner self and the community. Designing work experiences where children work with self-reliant artisans/professionals on reallife problems/possibilities to address the real needs of the community can help children understand self-reliance and true freedom. We can use work experiences with self-reliant artisans as a pedagogic medium for teaching and learning in schools. This will make education real and authentic. During work experiences children will also experience the value of craftsmanship, character and conservation – these are important underlying principles of self-reliance. They need to learn how to conserve resources and how important it is for selfsustenance. 10. PRODUCTIVE WORK AS THE MEDIUM OF TEACHING AND LEARNING. For Gandhi ji, work was productive if it is useful & meaningful in the local context of the child and in doing of which a child can be made to think and the required knowledge, skills and values can be developed through it. The purpose of using productive work as a medium of teaching and learning is to develop the productive/creative capacities of the child i.e. capacity to think, plan, design, relate and act and in the process empower him/her for life and living. The idea is not to train a child for any specific vocation but to develop creative and problem solving abilities. Gandhi ji strongly believed that by using productive work as a medium of teaching and learning in schools we could prepare children for a productive life and it will also help them to understand their local context, history and culture better. When children learn through productive work (for e.g. local crafts) they develop a relationship with work and life itself. How one relates with work is very important in life. Does one see it as a duty to be performed for living or a medium to express one's innate potential and uniqueness? Is it a means to satisfy personal desires and wants or a mean to contribute towards the development of the whole community? This relationship with 'doing' builds and shapes character. What we do in life and especially how we do it shapes our character. Craftsmanship is an ethic – the ethic of striving for perfection through continuous improvements and rework. It requires continuous planning and review, action and reflection. There is no goal or end objective to it. It is a way of life. Courage is not the absence of fear but the judgment that something else is more important. Therefore, to know what is important to me in life is really important. We need to understand the difference between 'what I need to do' and 'what is important for me to do'. If in twelve years of education, we can help children discover what is important to them in life –then half the challenge is over. After that it is a matter of working persistently towards it –taking one small step every day. Courage is also about mastering the process of over coming fears, fears that we face at every step in our life. In real life the problems cannot be classified as physics, history or civics problems. Instead, we need to apply knowledge from various disciplines to solve them. Using real life experiences as a pedagogic medium give children an opportunity to experience problems and possibilities in an integrated manner and more importantly it provides an opportunity to apply their learning in an integrated manner. The understanding that children develop is integrated and wholistic. The whole process of learning through experiences leads to an integration of knowledge in a very organic way- the opportunity and space for which is lacking drastically in the present education system. The present system fragments knowledge and the learning process. In this whole process of teaching and learning through real-life experiences, the role of a teacher is more of a designer and facilitator rather than the sole authority and source of knowledge. Knowledge is actually co-created in the process of learning from experiences. The knowledge provided by the teacher and the textbook is considered one of the many sources available to children. This reduces the dependence of children on teachers and text-books and gives equal validity to other sources of knowledge available in the community. The role of an educator is to facilitate the learning cycle and making sure that children with diverse learning needs and styles get equal opportunity to engage and learn. Note: Disha India's learning design principles are inspired by the ideas and philosophy of Gandhiji, especially his principles and pedagogy of Nai- Talim. 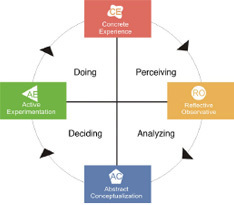 The Learning design principles are also profoundly influenced and guided by the work of Dr. Kolb (www.learningfromexperience.com). The principles and practices of Outward Bound (www.outwardbound.net) and Expeditionary Learning, USA (www.elschools.org) also guide and inform our work and practices deeply.